Ms. Gibbs received a $5,000 grant from Penguin Random House for her “Teen Book Bag” project. This earned her second place in the national competition, among four teachers recognized throughout the United States. The publisher will also be donating $2,500 worth of books to Ms. Gibbs. Essentially, her concept is brilliantly simple. Literature students are encouraged to choose a themed bag with three books to take home and read. Then per the classroom project slogan, students Read, Return, Repeat. This emphasizes that reading is a lifelong habit to be cultivated. 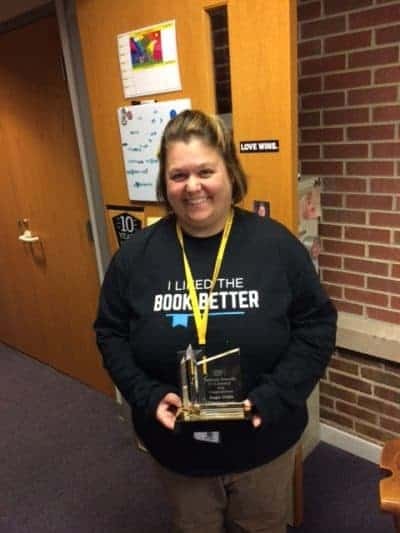 For some time, Ms. Gibbs had been mulling over how to ignite a love of reading in students who haven’t passed the ISTEP+ standardized test (currently, this is a 10th grade Indiana high school graduation requirement). 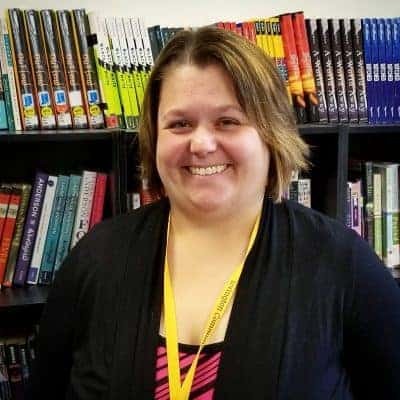 One day while at the Irvington Branch Library she noticed book bags that could be checked out by kids, akin to a grab bag, filled with random/surprise books. That was her ah-ha! moment. So she went ahead and set up book bags with themes in which her students tend to be interested. Examples of the names attached to the bags include “Hoop It” for basketball books and “Be Courageous” for books about teens who have the courage to be themselves and meet both daily and extraordinary challenges. Fiction and nonfiction books are included in the mix, and reading levels are purposely varied to meet students where they are at from a reading comprehension standpoint. “The goal is to promote literacy for the entire school,” Ms. Gibbs notes. The grant will fund the purchase of personalized bags for the books, the books themselves, a scanner to log the books on her computer (a librarian-like approach), and a hanging storage rack for the book bags.